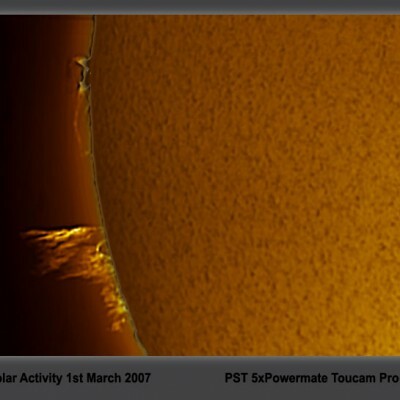 I’ve always had a passion for solar viewing and previously observed in the white light domain. 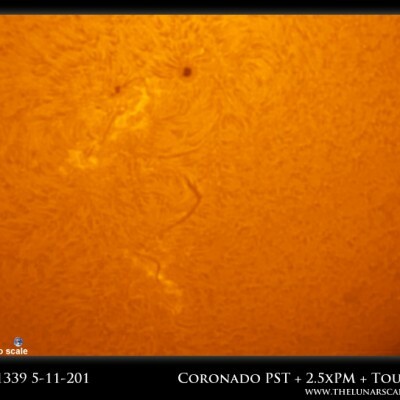 Given an opportunity to purchase a PST Hydrogen Alpha scope for ½ the retail price was a no-brainer. It provides a 40mm aperture, 400mm focal length for f10 in an all enclosed body. Unlike white light, in which you observe the solar photosphere in the visual light domain this tiny scope isolates the hydrogen alpha frequency (650nm). 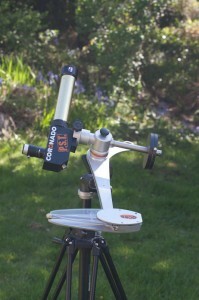 This allows us to examine sunsposts, plage, granulation on the disc and also obtain incredible views or solar prominences and filaments (something which is impossible in the white light spectrum as the sheer amount of light from the photosphere will completely drown out these phenomenon). 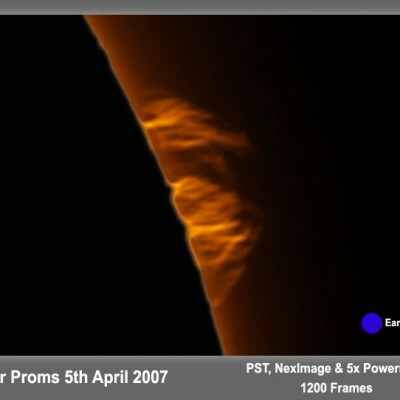 Here it is on my AstroTrak (yes the Astrotrak tt320x has a solar viewing rate!!!). I came close to buying a PST this smmuer but didn’t have time to look around at prices after all. Probably just as well considering I haven’t actually even looked through one yet!Your images are really great, really dynamic. Can I ask when you are actually looking through the scope, which of these images comes closest to what you actually see by eye? I have a Baader filter for my Dob and am impressed by the detail I can see with that but of course, no prominences visible there. really must find someone with one and take a look. I live in Greece so we generally get quite a bit of sun but guaranteed it will be cloudy if I buy!